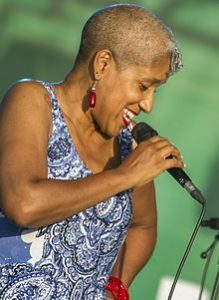 American songwriter and jazz vocalist René Marie performed on February 21st with her band featuring Quentin Baxter on drums, John Chin on piano, Elias Bailey on bass, and Randy Napoleon on guitar. Opening with “Turn the Page” by Bob Seger, Marie incorporated a variety of covers and original songs in her soulful performance. Marie proves that all musicians, at their core, are storytellers. She spins stories not just with her voice and musical accompaniment but with her breath, her body, her fingers and her feet. She falls into her music like a dancer, embracing the quirky high notes and deepest blues. She embodies her lyrics, striking an emotional chord that leaves the audience speechless. One of the strongest sets of the evening was the final composition titled, “Voice of My Beautiful Country”. This set proposes a question: what would our patriotic songs sound like if everyone in America, “this melting pot of a country”, could contribute their own voice? Marie’s answer feels like a perfect answer. After all, what music style could better encapsulate the energy, the vivacity, or the spirit of America better than jazz?